The most powerful Mi phone is considered to be the Xiaomi Mi 6. The company has worked on it up to 7 years. It’s packed with the latest full-blooded Qualcomm Snapdragon 835 chip, dual-camera, and many decent features. Thanks to a regular Mi design, ceramic/glass body, and incredibly low price tag the Mi 6 grabbed people’s attention and won their hearts immediately. Thanks to it the manufacturer is planning to sell over 80 million units this year. Thus the Xiaomi Mi 6 will bring back Xiaomi’s former popularity. That’s why many have been waiting for the larger variant of this awesome handset rumored as the Xiaomi Mi 6 Plus. But we have heard the company has canceled this model, and there is only one large-screen smartphone. It’s the Xiaomi Mi Note 3. A few months later we saw this rumor was true. But the Mi Note 3 differs from its founding father in some sense. Generally, it looks like the Mi 6 and it sports the same dual-camera module with great shooting performance, but the manufacturer has changed the chip and made it larger in size. Instead of the Snapdragon 835, it uses a Snapdragon 660. Another thing, instead of an 8MP front camera it comes with an upgraded 16MP camera with beautifying AI software. But two main features remain the same. I guess most of you have got acquainted with the look of this phone from our unboxing article. If not, we can recall the main design elements quickly. As we are dealing, with a super mid-range smartphone, it’s logical to see an elegant packaging. Unlike many other models, this one comes with a matte black box hinting at its class. The front side of the box carries only the phone’s name, while the main information about it is printed on the back. 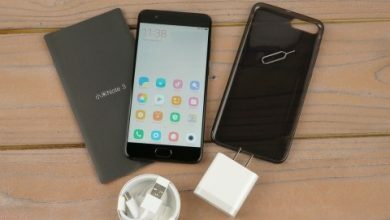 However, you won’t find anything unexpected inside the box – a standard set of accessories and documents including the phone itself, charging head, USB cable, a plastic case, and a user manual. Unlike the Xiaomi Mi MIX 2 announced at the same conference, the Xiaomi Mi Note 3 doesn’t come with a full screen. Though the latter is a mainstream, we are dealing with a more common model. It has narrow bezels on both sides at a width of 2.6mm. The screen has been enlarged to 5.5 inches. As you remember, the original Xiaomi Mi 6 sports a traditional 5.15-inch display. It comes with a resolution of 1080p. The upper side of the front panel carries a standard set of sensors as well as a front camera and speaker. Too little people know the Xiaomi Mi Note 3 supports Face Unlock function. Probably it’s related to the fact this feature doesn’t work on the hardware level like the iPhone X, but it uses the front camera to identify the face. Then a special software is used to unlock the phone. We have to state this function still works only in light conditions. Below the screen, we can find the non-porous home button supporting fingerprint identification and everything related with. I mean the fingerprint payment. The back is identical to the Xiaomi Mi 6. It uses a four-sided curved design, which looks incredible on a glass body. The dual-camera sensors are placed on the upper left corner paired with dual-flash lights. They don’t bristle at all. On the lower part, we can notice the company’s logo and some info on the model. The Ambilight effect is seen well when holding it at a special angle. The noise reduction microphone and an infrared emitter are placed on the top. From the bottom part, we can understand this handset want you to use wireless earbuds. There is no 3.5mm audio jack. The bottom side carries two speakers and a USB Type-C port between them. The volume rocker and a power button are on the right side. Generally, looking at the phone from aside we can see what a thin body it comes with. The stainless steel frame found on the Mi 6 is replaced with a 7 series of aviation aluminum. That’s why it’s lighter than the aforementioned phone, though it is larger. Moreover, it’s lighter by 25 grams than the iPhone 7 Plus. The Xiaomi Mi Note 3 is packed with a high-pass Snapdragon 660 chip. We learned about it before the launch. This is the latest addition to the 6 series, and it’s known as a ‘flagship image processor.’ It’s called in this way because it supports dual-camera options with a great DSP. This is the same Hexagon 682 used in the Snapdragon 835. But this chip is great in terms of performance as well. It’s the first SoC to use independent Kryo architecture. The Snapdragon 835 scores over 180.000 at AnTuTu. It’s been considered as the fastest chip in the market. But recently Huawei announced the Kirin 970, world’s first AI mobile computing platform. It should score over 200.000. As for the Snapdragon 660, it’s fast but not enough. AnTuTu showcases 113.934. On the other hand, this is the way faster than many mid-range chips. Moreover, it’s faster than other 6 series processors such as the Snapdragon 653 and 625. The Snapdragon 660 scores 1610 at a single-core test, and 5142 at a multi-core test. In the screenshot below we can see the improvement level of the chip in comparison to its predecessor of SND653 as well as the SND625. This score is satisfactory as well. Qualcomm has announced Snapdragon 653 has improved the GPU performance by 30% in comparison to the Snapdragon 653. Seems, it’s so. The PCMark test shows the Huawei P9 and Huawei P10 are at the same level as the Xiaomi Mi Note 3. The reading speed is at 270mb/s. Playing the King of Glory showed 50fps most of the time. Although this feature reached 60fps periodically. The selling point of the Xiaomi Mi 6 is its dual-camera on the back. This statement is right for our hero, as it sports the same camera module with the same features. But it comes with software and algorithm improvements that should become available for the Mi 6 later. That camera uses two 12MP sensors – wide-angle lens with focal length of 27mm + telephoto lens with focal length of 52mm. The wide-angle lens comes with an aperture of f/1.8, while the aperture of the telephoto lens is f/2.6. There was an interesting research – 63% of users can distinguish Xiaomi Mi 6 shots from others. We have talked about this technology in a special article. So it’s better to take a glance at sample photos taken by this camera. There is an enhanced 16MP front camera coming with a beautifying AI software. Thanks to it the phone is capable of taking great photos with clear edges. Intelligent AI beautifying program can analyze the skin color and enhance it for anyone personally. Plus, it retains the face details and does a 6-step process for the final capture. This model comes with a 3500mAh capacity battery, which is 4% more than the Mi 6’s 3350mAh battery. But the screen of the Xiaomi Mi Note 3 has been enlarged by 7%. So the overall performance should suffer a bit. The PCMark shows it can be used for 12 hours and 3 minutes. This is not bad, but say the Xiaomi Redmi Note 4 can last for 11 hours and 1 minutes. Although the latter is equipped with a 4100mAh battery. The Mi Note 3 provides longer lifetime to the Snapdragon 660 and 14nm process node it runs on. To understand how many hours of video playback the phone provides we started watching video online when there was remaining 95% of power. After one hour there was 85%. Thus the Xiaomi Mi Note 3 provides 10 hours of video playback. The same was done for the gaming test. When we started playing the King of Glory there was 82% of power. After a half hour, there was 74%. So the phone provides up to 6 hours of playing games. The Snapdragon 660 as well as the Xiaomi Mi Note 3 support Quick Charge 3.0. That’s why it can charge fully within 95 minutes. China is the biggest market. There are up to 221 cities with 9842 retailer stores selling smartphones. The total smartphone sales number is 34.51 million units for July 2017. Thus it is increased by 19.2% if compared with last year. Interestingly, the online sales decline gradually. The main reason why this is happening is related to the fact Chinese manufacturers are actively working on developing their own smartphone lines. So users are getting more and more tied to certain lines. This simply means people are more concerned about the performance their preferred smartphone lines bring rather than other features. That’s why they need to test it in real. This is also the main reason why Xiaomi has decided to change the gorgeous look of the Note series flagship making it classier. It also allowed the company to price it affordably- the lowest version costs 2499 yuan ($383).